On January 4, 1850, in the Welsh town of Bettws a son was born to a man whose first name I’ve been unable to determine, but whose last name was Griffith. He must have figured it would be a hoot to name his son redundantly, too, but he chickened out and made his middle name Jenkins. When he was 14 Griffith Jenkins Griffith came to America to seek his fortune, and found it pretty quickly, in mining and land speculation. By 1896 he owned great chunks of land around the little town of Los Angeles. That was the year he gave 3015 acres of it, five times the size of New York’s Central Park, to the city … which didn’t want it. (By the way, I got some of this information from an article by a man named William Ian Williams, if you can believe that.) It was too damn far from anything, way out in the middle of nowhere. There weren’t any roads to it. Who would use a mountainous patch of scrubland like that? But eventually they stopped grumbling and took it. 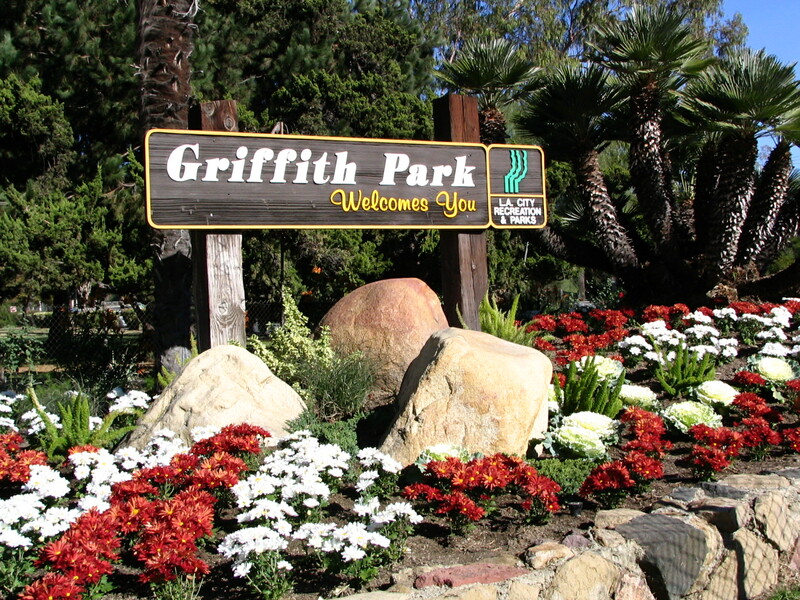 Griffith Griffith wanted to build an outdoor theater, an aerodrome, and an observatory in the park. He had a lot of plans, and they were all for the public good. But he was widely disliked by the LA upper crust, who called him “The Midget Egomaniac.” He styled himself “Colonel,” though he had never held that rank in any army. He married a rich woman, Christina Mesmer, and nobody could figure out why a classy lady like her would hook up with a jerk like “Colonel” Griffith Griffith. (Do you think he might have Mesmerized her?) And he was … well, nuts. He drank heavily, and came to believe that the Pope was out to poison him. 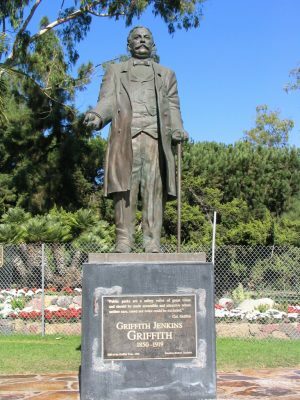 He was Protestant, Christina was Catholic, and one day in 1903 while taking a “rest cure” in Santa Monica he shot her in the eye. Still alive, she jumped out the hotel window and landed on an awning below, which saved her life. (Jeez, it’s just like a Hollywood thriller, isn’t it?) She scrambled in another window on the floor below and survived, though disfigured. At his trial his lawyers pioneered the “diminished capacity” defense, contending that he suffered from “alcoholic insanity.” The jury at least partly bought it, as he was sentenced to only two years. He served them in San Quentin, where he refused parole and did his full ride. Even though he seemed genuinely remorseful and reformed, he was about as welcome in polite society as a fart at a funeral. But he was still rolling in dough. The City Council at first refused the seed money he offered to fund his amphitheater and observatory, but in the end no politician can turn down the green stuff. 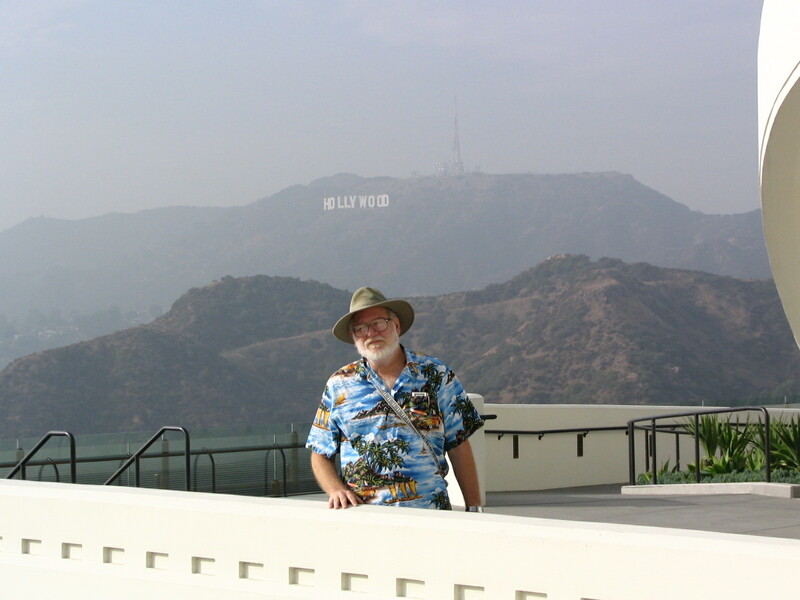 They did punish him by changing the name of his park’s highest point from Griffith Peak to Mount Hollywood. Colonel Griffith Griffith didn’t live to see his dreams fulfilled. 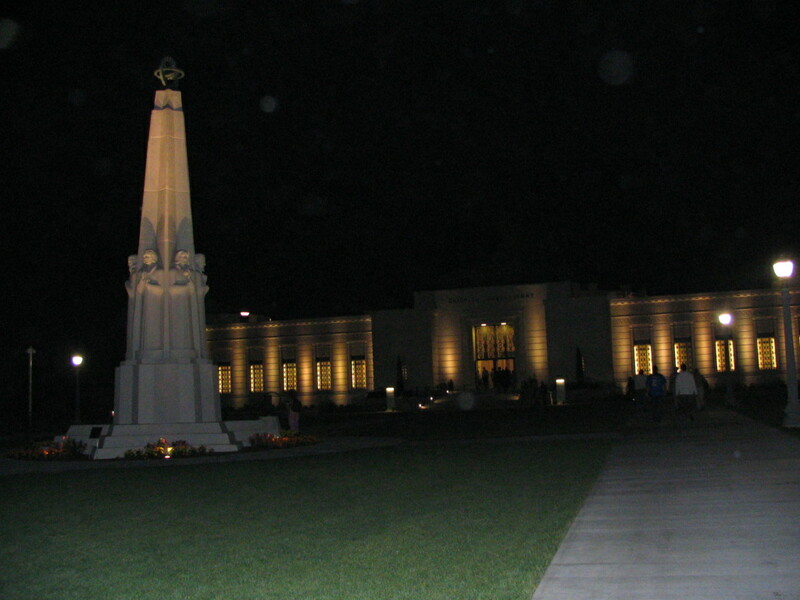 He died in 1919, and was buried in what is now called Hollywood Forever Cemetery under an imposing obelisk. 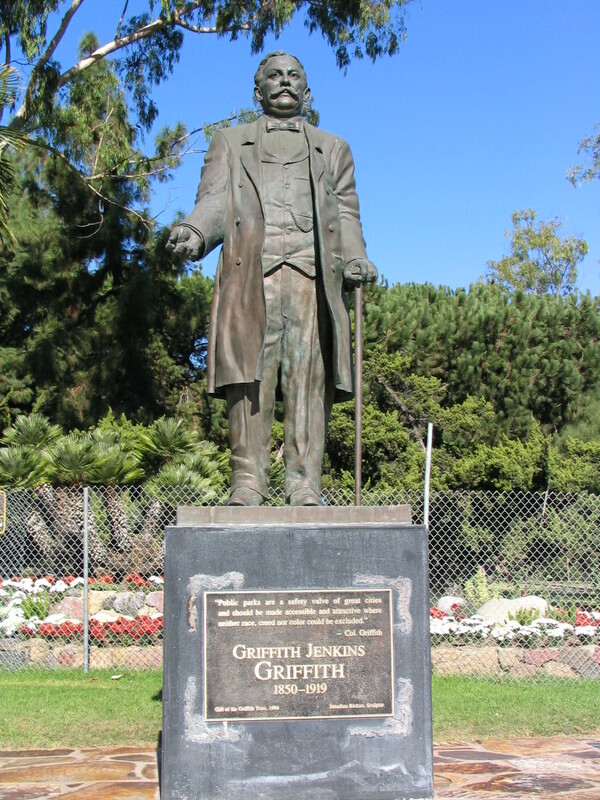 There’s a statue of him at the Griffith Park entrance at Los Feliz and Crystal Spring Drive. For some reason, this strange tale just feels like a quintessentially California story, a totally Los Angeles story. And I researched the whole thing sitting right here at my desk. God, I love the Internet! The observatory was finally completed in 1935 and was an immediate hit with Angelenos. 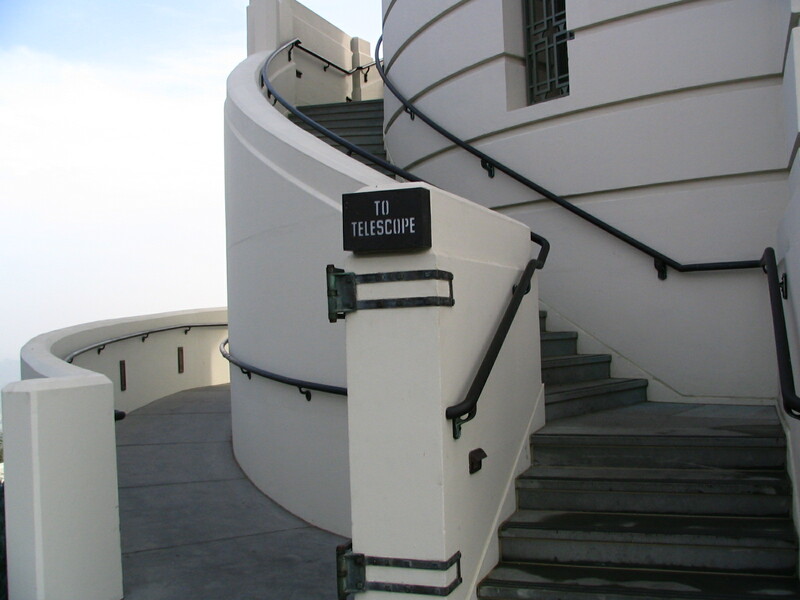 It had a 12-inch Zeiss refracting telescope that you could actually look through. More than 7 million people have done so. 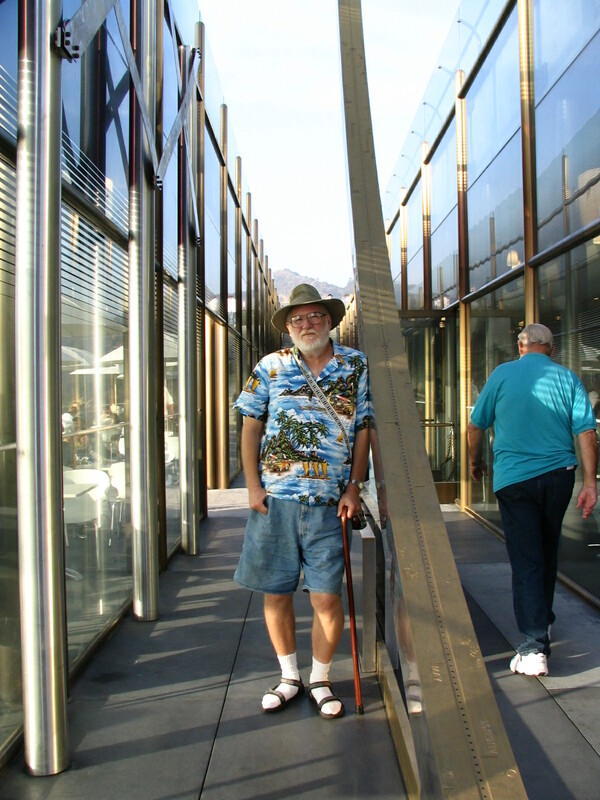 It had a coelostat, and a Foucault pendulum, and a solar telescope, and a camera obscura. 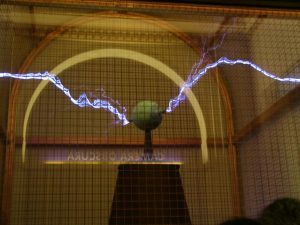 It had a big Tesla coil, and it had a planetarium, famous for its uncomfortable chairs with wooden headrests. The building is in Art Moderne style, which I understand is a sort of Late Art Deco. It is lovely, with white stucco contrasting with the green-black patina of the copper domes and trim. Los Angeles doesn’t have a signature structure, something like the Statue of Liberty or the Gateway Arch or the Golden Gate Bridge, you look at it, you instantly know you’re in New York, St. Louis, San Francisco. I’ve thought about it for a while, and I can’t come up with anything like that for Los Angeles. I think the observatory is the closest we come, perched up there on the south peninsula of Mount Hollywood nee Griffith, above the smog, visible over a very wide area. 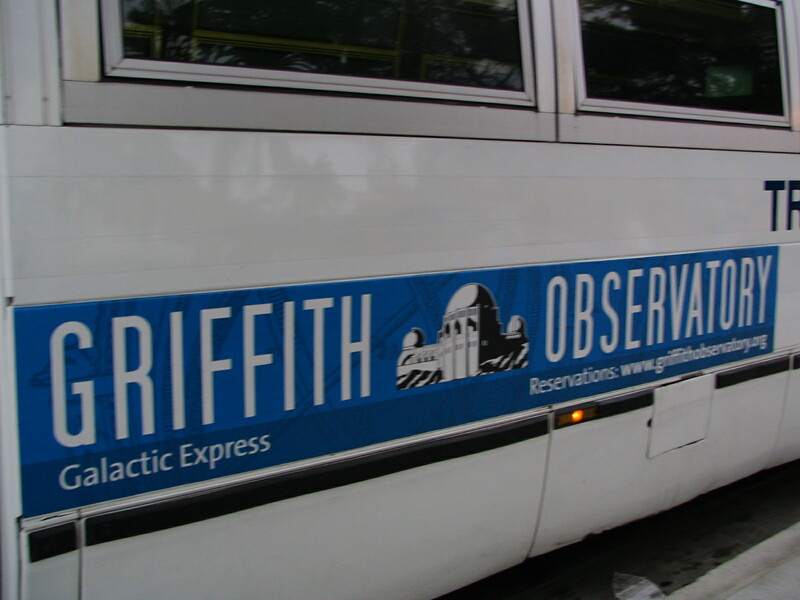 The current observatory director recently referred to it as “The hood ornament of Los Angeles,” and that is so apt, and so Los Angeles. Well, the building got old, as these things do. Back in 1935 they weren’t building things anywhere near the 21st Century earthquake codes, the next big quake could take the whole thing down the hillside. Plus, it was showing its age in many ways. 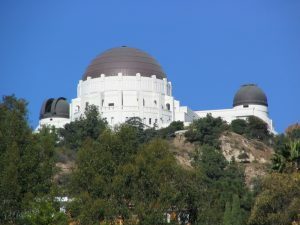 So the city and the Friends of the Observatory raised some money—$93,000,000 is what I heard—and in 2002 they closed it down for renovations. I think it was planned to take 3 years, but they ran a little long. 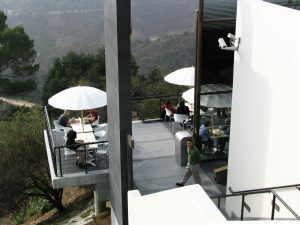 A few days ago, November 3, 2006, they opened it up again … and Lee and I were there on the first day! That was more of a coup than you may realize. 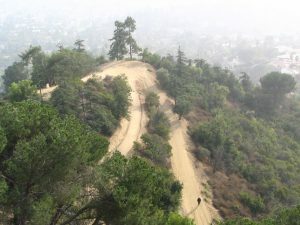 There is almost no parking up there atop Mount Hollywood, maybe 70 spaces, tops, and no room for a larger parking lot (and no enthusiasm for cutting down a lot of trees and replacing them with asphalt or digging an underground garage). The road leading up there is two-lane, non-expandable, and twisty. The people in charge envisioned monumental traffic snarls and angry motorists fighting each other for every available slot. 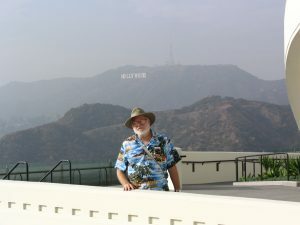 So they inaugurated a system of shuttle busses departing from Hollywood and Highland, or the temporary observatory annex next door to the Los Angeles Zoo and the Gene Autry Museum, both of which have ample parking on flat land. They closed the road from the Greek Theatre (another Griffith Griffith dream that came to pass) upward, only busses allowed. It is not known how long this state of affairs will last. If attendance drops after a few months they may open the road again … but don’t count on it. Everyone in Los Angeles we’ve talked to is determined to get up there, as soon as possible. Myself, I’d be perfectly happy if they left that road closed to cars forever. So we boarded the bus and were on our way. 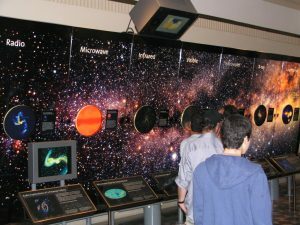 They showed a very informative and helpful video on the trip, telling you the best way to see the place, advising you to get tickets for the planetarium show promptly upon arrival if you intended to see the show. And up we went, past the Greek Theatre, through the tunnel, twisting along the spaghetti road on a hazy, slightly chilly day. The day could have been better, actually, but we weren’t complaining. In LA, it’s fog or haze if you look up and can’t see blue; it’s smog if it’s hugging the ground. This was mostly haze, no sunshine getting through. We could see part of the Los Angeles Basin, but not as far as downtown, and much short of the sea. But it was still a great view, and next time we’ll pick a summer evening when it’s almost always clear and warm. The building and grounds are gorgeous, and you’d hardly know they’d done anything to it, externally … which is as it should be. Nobody wanted to tamper with the classic lines. But looks are deceiving. What they did … basically they gutted the whole structure. I’ve seen pictures of the work, and there was really nothing left of the interior when they’d finished the excavating, just the exterior shell, and they were drilling into that, reinforcing and patching. (There are wonderful murals in the rotunda, and those were taken down intact and conserved, then put up again later.) Then they hollowed out the space beneath the building, poured new foundations, and made two entire levels beneath it, more than doubling the exhibit space. They turned these parts and the wings off the rotunda into hands-on astronomy exhibits, and they are cleverly done (though about half were not working; start-up problems, I assume, nothing ever works exactly right the first time). The only place you can detect a difference from the 1935 original from the outside is from the west side, where a new entrance has been built, with stairs down to the new lower levels. Even that is astronomically themed, and called the Gottlieb Transit Corridor. 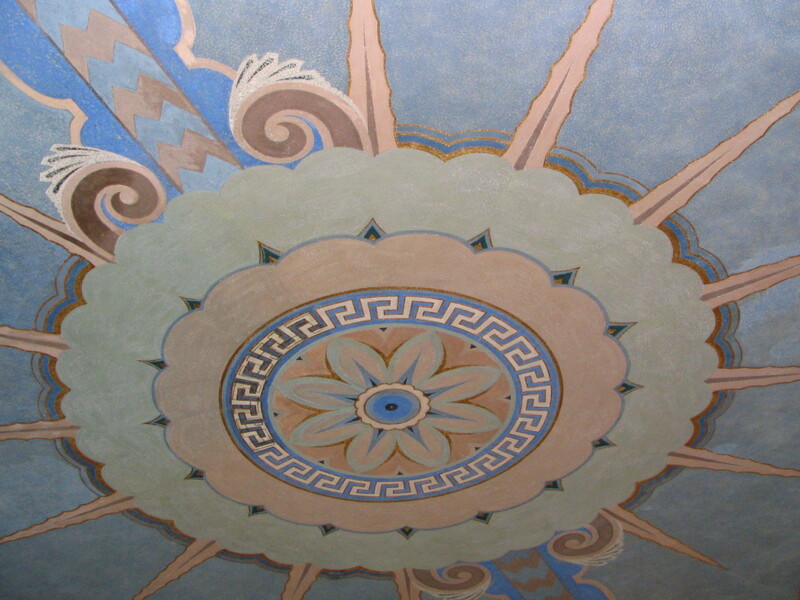 Things illustrating various events in the sky are embedded right in the architecture. For instance, the handrail in the stairway points directly to the North Star at night. Down there is a gift shop and the Café at the End of the Universe, operated by … Wolfgang Puck! Does anyone remember when he was a renowned gourmet chef? Now he runs the food concession at the Natural History Museum and here, and sells canned soup at Ralph’s. He’s one step up from McDonalds. The grounds in front are immaculate. 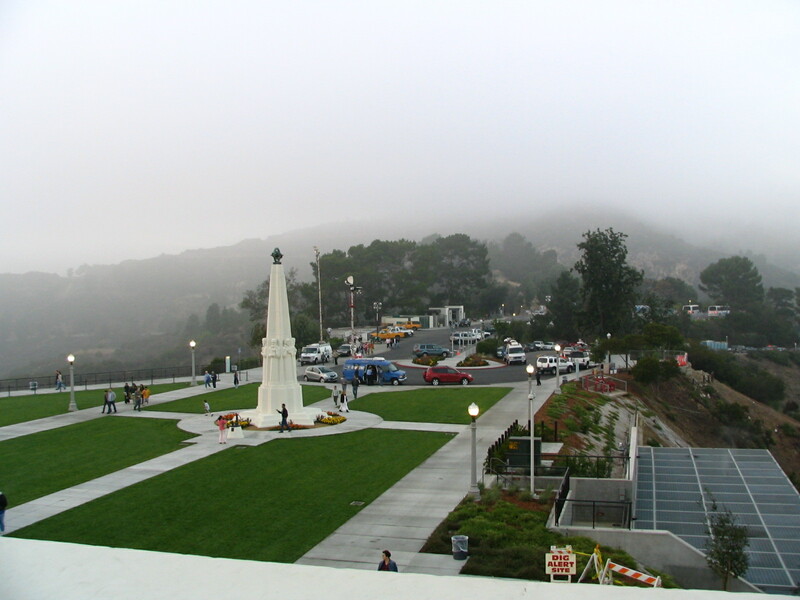 Lots of grass, a monument to six great astronomers of the past, and a bust of James Dean, who starred in Rebel Without a Cause, which had many scenes shot at the observatory, inside and exterior. There are also metal lines etched in the concrete showing the orbits of the planets, to scale. 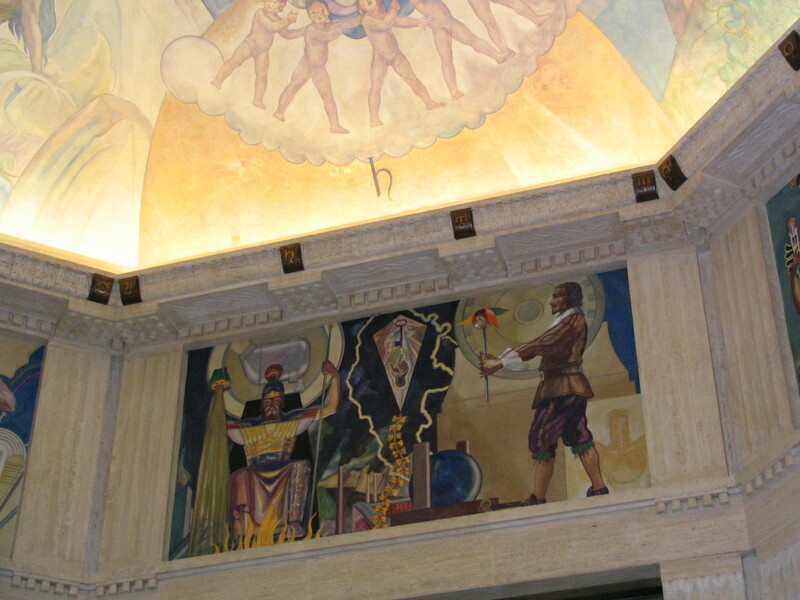 (Pluto’s there, because it was demoted shortly after construction was finished.) You get a real sense of the difference between the inner and outer planets. You can take one step from Earth to Mars, but it’s quite a few steps to Jupiter, and a real hike out to Neptune. Inside, I went straight to the desk where they were selling planetarium tickets … and seemed to fall into a time warp. 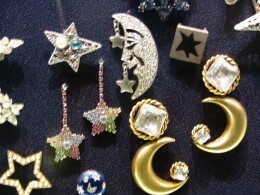 The woman behind the counter was young, petite, gorgeous, and dressed in a low-cut ’40s black dress. Her platinum-blonde hair was in a Marilyn Monroe style, she was pale, and wore bright red lipstick on her bee-stung lips. Lee and I agreed she had a sort of Carole Lombard thing going, and it worked very well for her. I wondered if she always made herself up like that, or if this was in honor of the opening. But I didn’t have the nerve to ask. We got tickets ($7) for a show starting in 30 minutes. 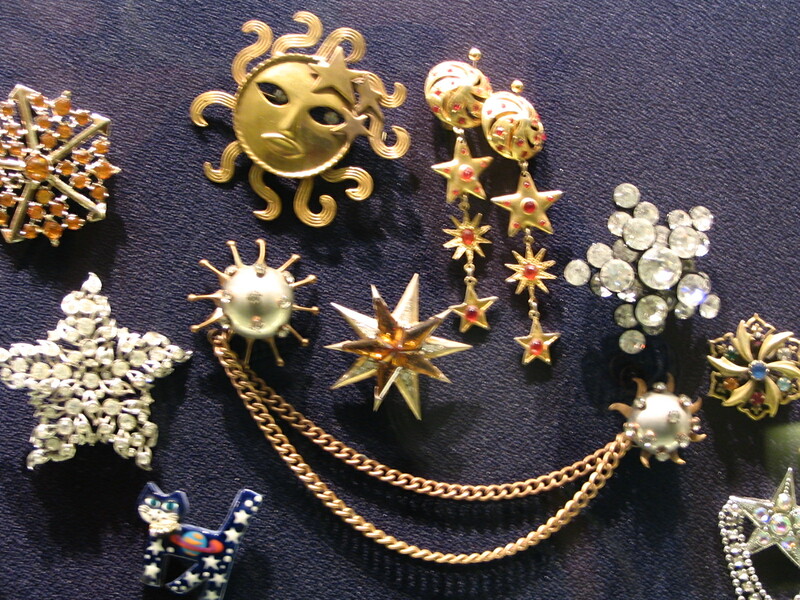 During World War II the planetarium was used to train pilots in the skill of celestial navigation. The planetarium was again used for this purpose in the 1960s to train Apollo program astronauts for the first lunar missions. That is so cool! I never would have guessed a planetarium was part of the moon missions training! 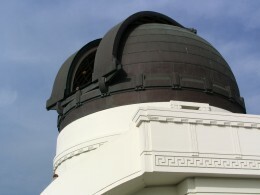 The planetarium was renovated in 1964 and a Mark IV Zeiss projector was installed. 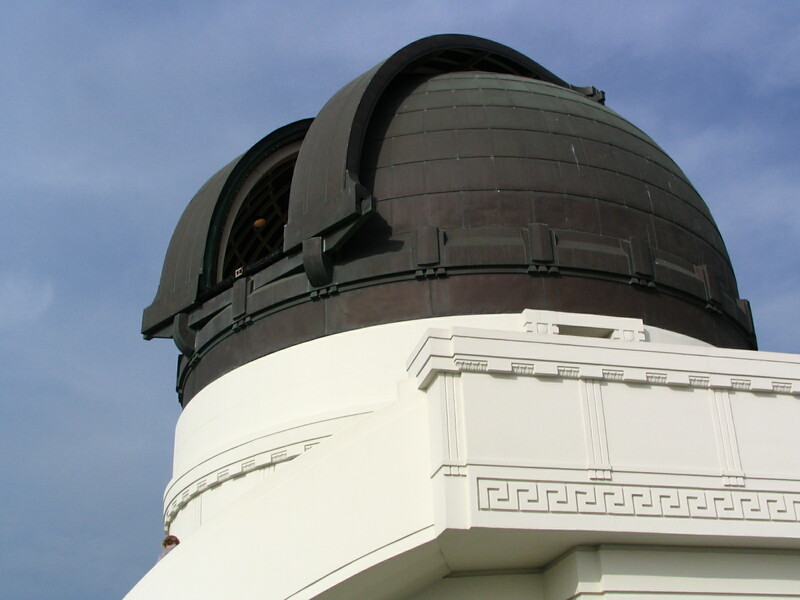 It’s been renovated again, the plaster dome replaced with perforated aluminum for better reflectivity, and the old Zeiss Mark IV has been replaced with a Zeiss Universarium Mark IX. Several million dollars right there. The facility never had a name before, but now it’s the Samuel Oschin Planetarium, in honor of the family foundation that donated a lot of money for it. Fine with me; we need more supporters of astronomy and space. It’s got half as many seats, but they are recliners and are reportedly much more comfortable. Seeing the old ones in Rebel Without a Cause yesterday, I can sure believe it. I could have slept in mine. Unlike many other planetaria, Griffith Observatory continues a 71-year tradition of presenting live planetarium programs with a lecturer who can connect with audiences and convey astronomical knowledge with enthusiasm and passion. … if you’re interested … this in a universe that stretches 14 billion light-years in every direction. You gotta figure there are billions of civilizations out there that we will never, never, never be aware of. I digressed. I was conflicted about the show. 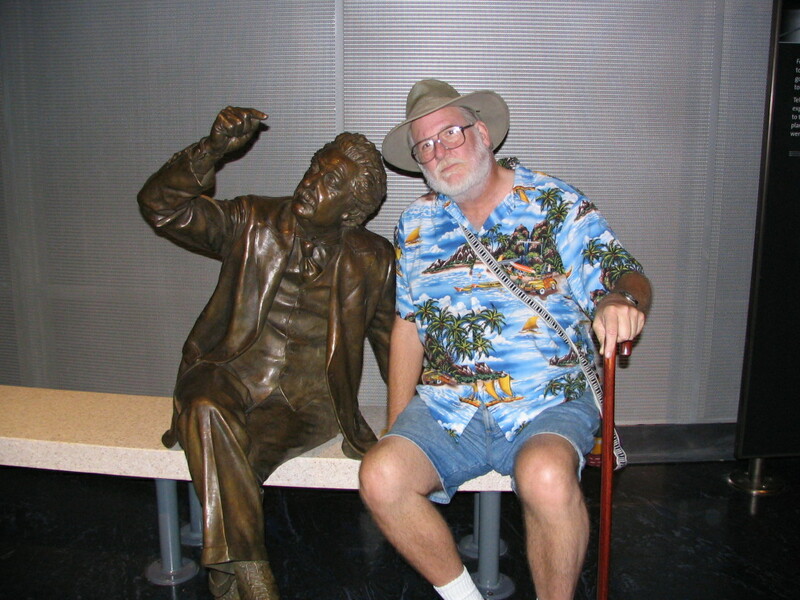 Maybe a little more regular astronomy, and a little less show biz? The Mark IX is capable of showing the sky from any position on Earth, of speeding up time, going backwards in time, all sorts of cool things. About all we got to see it do was show the motions of the planets. I’m not saying the show wasn’t educational, it was—it dealt with the concepts of dark matter and dark energy, about as well as you could in a show for the general public … and I guess that’s the thing. In an era when you can go to an IMAX theater and see things more eye-popping than this, I guess a planetarium has to do its best to keep up. But maybe they could do different shows after dark, when the serious astronomy buffs show up for star parties and such. I know the show we saw won’t be there forever, and I plan to go up there every time they change it. Suggestion in the other direction: If you’re going to go for the Hollywood spectacular, go all the way. This show gives a damn good impression of depth, of moving through infinite space, but a polarized 3-D show is much more impressive. I speak from experience; I saw one at Huntsville, at an IMAX theater, and I wish I could see it again. Griffith Griffith’s original telescope is still there, and the public is still invited to look through it, though that day wouldn’t have been a good one, as by evening the fog was rolling in from the ocean pretty thickly. We got in line and managed to get into the building to see it—it’s on an equatorial mount so well-balanced that the operator can move it up and down with one hand—but there was a media crew in there taping a story, and it looked like it would take a while. There’s this big wooden stairs platform on wheels that they move around, because when you look at something near the horizon the eyepiece is maybe twenty feet above the floor! Outside, we could see the old copper dome rotating. Gotta go back and look at Jupiter and Saturn through that baby. There were six or seven media trucks in the parking lot, all with their dishes up, all waiting to do a Live at Five report. 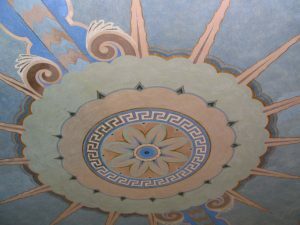 The restored upper levels were full of interesting exhibits, with the caveat that many of them seemed worn out already or were not working properly. I expect they’ll work out the bugs. There was the solar telescope, which wasn’t too interesting on a cloudy day, but the videos of sunspots and flares were. We didn’t linger here, as there were a lot of people around and the space was cramped. The crowds were not overwhelming, thanks to the reservation system, but we were anxious to get downstairs to the new Gunther Depths of Space exhibit gallery. The Big Picture: At 152 feet long and 20 feet high, The Big Picture is the largest single astronomically accurate image ever produced. Comprising real observational data of a part of the sky showing over a million real stars, galaxies, and other celestial objects, The Big Picture features stunning detail of the Virgo Cluster of galaxies and beyond. Because the image for The Big Picture is drawn from recent all-sky digital image surveys by the world’s most sophisticated cameras and telescopes, the resolution and clarity of the objects causes visitor perception of them to change as they move toward and away from the wall, including the illusion of depth and real increasing detail. In its immensity, detail, and execution, The Big Picture is unlike any exhibit ever undertaken. Boy, they got that right. I think this may be the most impressive thing in the place. It’s produced on big ceramic sheets, so you can walk right up and touch it without worrying about wearing anything off. Or you can put your face a few inches away, and see just how many galaxies there are in a square inch. 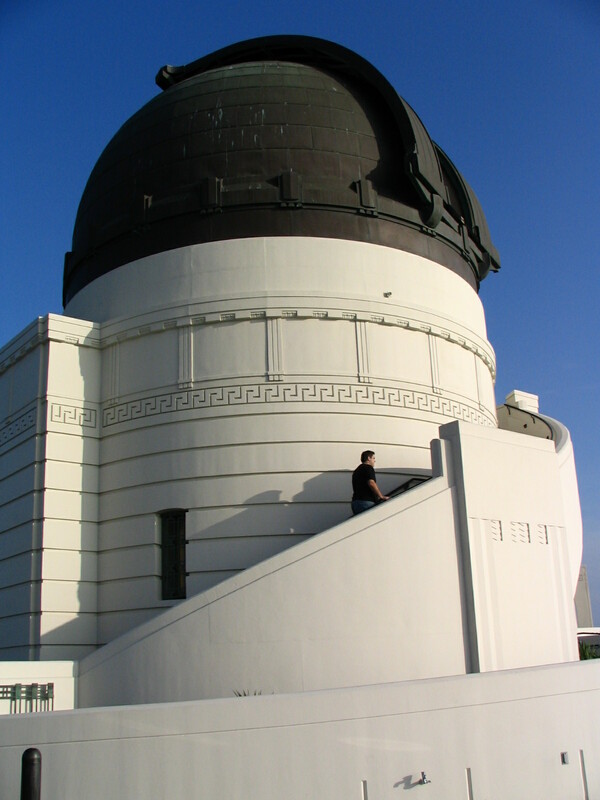 Or you can go to the upper level and look at it through a telescope, and feel like you’re looking at the real thing. I wouldn’t be surprised if there were a million objects on this big picture, and very few of them are stars. The galaxies range in size from maybe a foot across to just little fuzzy dots. So incredibly many of them. There is another theater down on the lower level, the Leonard Nimoy Event Horizon Theater. I wondered about that, did they name it after him just because he’s famous and played Spock? But it turns out he and his wife were big donors, and supporters of the arts and sciences. 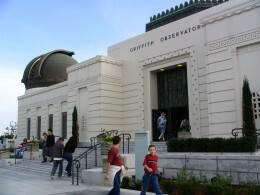 They’re showing an 18-minute film in there called “The Once and Future Griffith Observatory,” and they say it’s a multi-media venue, so they can do a lot of things in there after the novelty of the re-opening has worn off. We didn’t see the show. We never happened to be in the right place when they were letting people in. It’s free. We’ll see it again on the next visit. One more thing worth mentioning is the Cosmic Connection, a long circular ramp taking you from one level to the next. It is one long display case, and inside is … junk jewelry. One of the observatory trustees started collecting astronomically-themed jewelry 20 years ago, when the planning started for this building. Stars, planets, little astronauts … 2500 pieces, stretched out in a long line that is supposed to represent the history of the universe, starting at the Big Bang. I don’t know about that, but it was a charming display. Next time you get to Los Angeles, this is a must see. Lee needed more pictures, so we went up to the observatory again, but this time we did it at night. It was even nicer, mostly because it was clear and you could see all the way to Long Beach. (Well, probably not, but it looked that way.) The lights were on in Dodger Stadium, downtown was sparkling. We picked out the Los Feliz 3 theater on Vermont Street, saw Normandie Street pointing at us like an arrow, and Western and Sunset Boulevard on its way to Silverlake, and the buildings at Hollywood and Vine. But we barely made it up there at all. We parked at the zoo, walked to the boarding area, and went directly aboard the bus. The doors closed behind us, and we were off. What luck! No such thing. It quickly became apparent that something was badly wrong with the bus. There was little traffic on Los Feliz, but we were crawling. I couldn’t figure out why we were going so slow … and it gradually dawned on me that it was the fairly gentle slope of the road. The driver had the pedal to the metal! And that’s how it went all the way to the top, a trip that should have taken 10 minutes but lasted 30. I wouldn’t quite call it a walking pace—we’d still be on our way up—but an in-shape jogger would have had no trouble keeping up with us, and probably would have beaten us. There were several times when I was sure we’d stall completely and be stranded on the side of the road, prey to the terrible coyotes that run in great slavering packs up there. They’d be happy to switch from a diet of Pomeranians and Cockapoos to a busload of stargazers. How long before we’d be drawing lots to see who would be eating whom? Could I drink urine to survive? Could Lee eat me, or would I be too fatty? I was reviewing all my old Boy Scout knowledge about making fires so we could possibly signal for help … then the old bus wheezed … I think I can, I think I can, I think I can … and turned the last corner into the parking lot. If I’d had a gun I’d have put a few rounds right through the radiator, put the damn thing out of its misery. But aside from that, it was great. We looked through the telescope and saw a star cluster in Cassiopeia, and the astronomer on duty told us the best time to come back and look at Jupiter and Saturn would be early October. We saw the show at the Leonard Nimoy Event Horizon, and it was quite interesting, giving the history of the place (though no mention was made of the scary side of Griffith J. Griffith—you heard it here first! ), and fascinating details of the renovation and what a challenge it was. 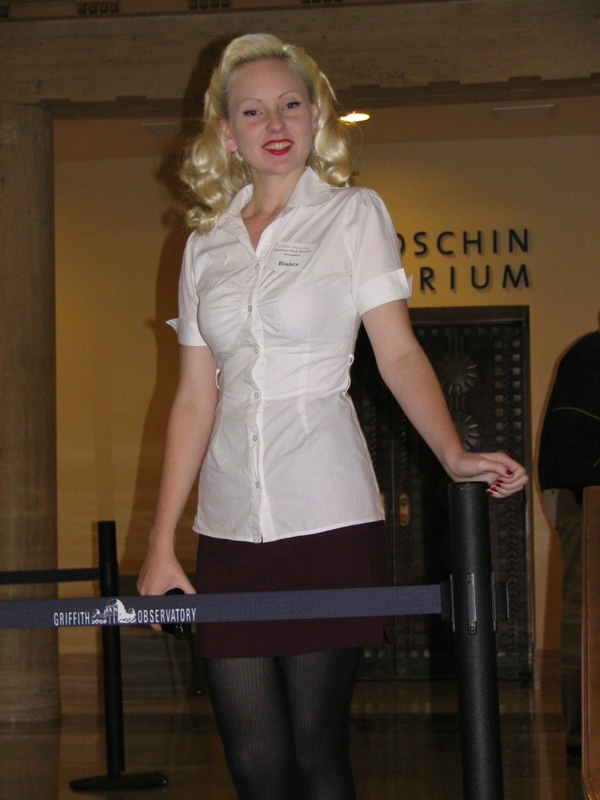 The pale, platinum blonde was there again, more conventionally dressed this time. Her name is Bianca, and Lee got a picture of her. The guy demonstrating the Tesla coil had an amusing spiel. There were three telescopes set up on the patio, and helpful amateurs pointing them at things like the Pleiades and a star cluster. 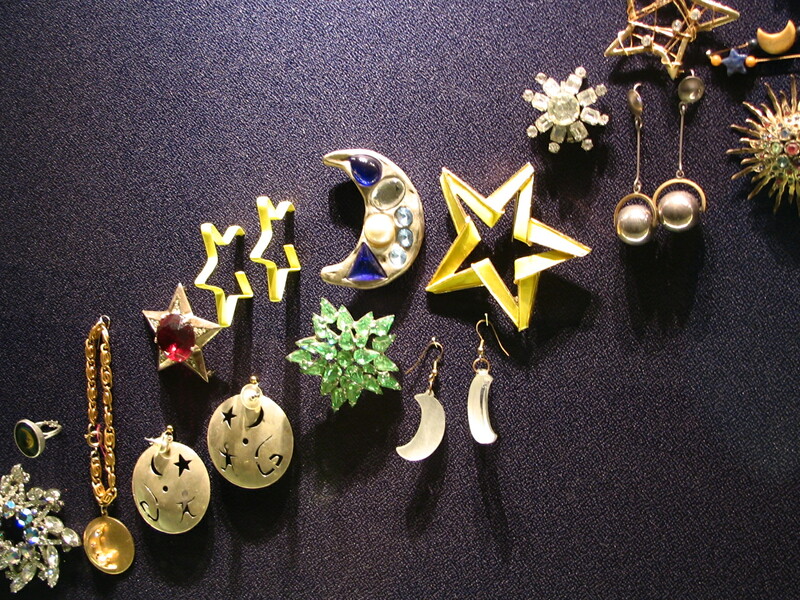 I think Lee took a picture of every foot of the Cosmic Connection corridor, the one with all the astronomical costume jewelry. Maybe she can make a mosaic to put up on our wall, like the Big Picture down in the Depths of Space exhibit. The last thing we did was spend a little more time with the Big Picture. We learned from Leonard Nimoy that there are almost 2 million objects visible in it, and I say again, it is a wonder beyond anything I’ve ever seen. There is a video that explains what a paltry fraction of what you can see is in relation to what is even deeper in the picture, the stuff that’s way out there, and just what a small segment of the sky it represents.